– Remove the existing fuel filter. – The filter can be reused, or a new filter can be installed. 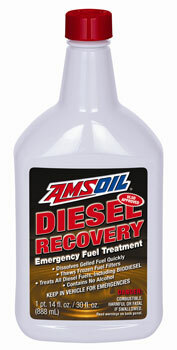 – Fill the replacement fuel filter with AMSOIL Diesel Recovery. – Install the replacement filter. – Add the remaining Diesel Recovery to the fuel tank. – Start the engine and allow the fuel system to circulate until full power has been restored.